This flavour-packed fish pâté and spicy pitta crisps can be served as individual starters, or as a shared dip. Preheat the oven to 180°C, gas mark 4. Place the fish in a medium-sized shallow pan, cover with cold water, then bring to the boil over a high heat. Put a lid on the pan, remove from the heat and leave for 5 minutes. Transfer the fish to a plate to cool. Pat the cooked fish with kitchen paper to dry. Remove any skin or bones and flake the flesh into the bowl of a food processor. Add the lemon zest, juice and soft cheese, then blend to make a coarse pâté. Add the chopped chives and capers, and whizz briefly. Transfer to a bowl, cover, then chill for at least 2 hours. Carefully cut each pitta through the middle. Place cut-side up on a chopping board and rub with a little olive oil then sprinkle with cayenne pepper. Cut each piece into rough triangles. Place on a baking sheet and cook in the oven for 5-6 minutes until golden brown. 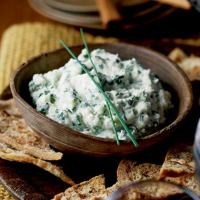 Place the pâté in a serving bowl or in 4 ramekins, garnish with the reserved chives and serve with the pitta crisps. Both the pâté and the pitta crisps can be prepared up to 24 hours in advance. Keep the pâté chilled and store the pitta crisps in an airtight container. Serve with a soft juicy red wine.